This event was also a reunion for the alumni of Professor Arnold Ross's summer program for high school students talented in mathematics. Professor Ross began this multi-level summer program in 1957 and he ran it every summer until 2000, giving the number theory lecture each morning. Click here to see photos from that reunion. 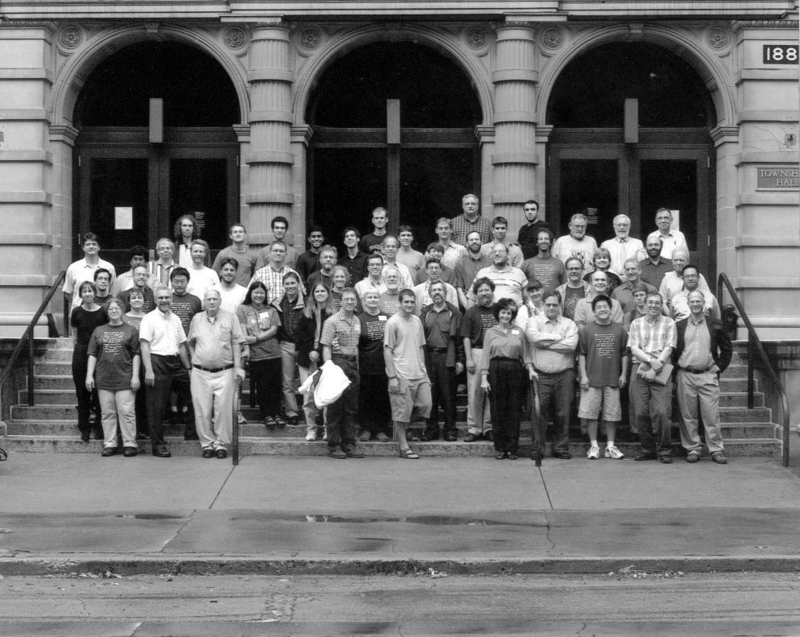 Further photos from 2001 have been posted by Dan Bach at Dansmath. Here is the schedule of Reunion-Conference events. All lectures were held in EA-160 on the campus of The Ohio State University in Columbus, Ohio. 10:15 - 11:00 -- G. Whitney, "Are two crystal balls better than one?" 11:15 - 12:00 -- T. Weston, "The Dirichlet class number formula." 1:30 - 2:15 -- S. Haber, "How to time-stamp a digital document." 2:25 - 2:45 -- J. Riedl, "Collaborative Intelligence for Information Filtering." 3:45 - 4:30 -- T. Roby, "Teaching cultures in the US, China, & Japan." 4:40 - 5:00 -- D. Fried, "Beyond continued fractions." 10:00 - 10:20 -- P. Hersh, "Moebius functions in combinatorics." 10:30 - 11:15 -- G. Francis, "The geometrical puppetshow." 11:25 - 11:45 -- J. Lurie, "Combinatorial games." 1:30 - 4:30 -- Wexner Center showing of "Fermat's Last Tango." 10:00 - 10:45 -- L. Evans, "A very heavy dose of old-fashioned plane geometry and some recent developments." 10:50 - 11:10 -- M. Berriozabal and M. Warshauer, "Summer math programs following the Ross tradition." 11:15 - 11:35 -- T. Banchoff, "Twice as old-again." 11:40 - 12:00 -- A. Borchers, "The Steiner tree problem." 12:15 - 1:30 -- Women Alumnae Lunch. 1:30 - 1:45 -- M. Richard, "Mathematics is independent of time." 1:50 - 2:10 -- C. Blair, "The sum of reciprocals of primes." 2:20 - 2:50 -- P. Bouchard, "The circles group." 3:30 - 3:50 -- T. Hagedorn, "Mathematics and Bioinformatics." 4:00 - 4:45 -- K. Conrad, "For two special reasons." We are grateful to the Number Theory Foundation for a grant to provide partial support for the younger participants. Further thanks are due to the Clay Mathematics Institute, which is not only providing major support for this Reunion-Conference but is working once again as a partner of the Ross Program in running the high school summer program pioneered long ago by Arnold Ross.